GOOD TIMES, GOOD TIMES - Just in case you didn't notice, the Boston music scene is healthier than ever with a slew of exciting new bands and tons of impressive touring artists visiting each week - just in time for your summer! 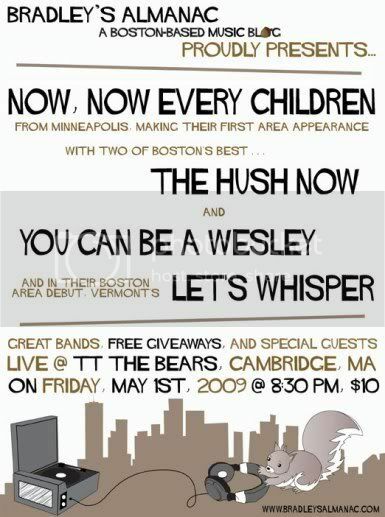 Added to all this, of course, is the emergence of Boston Music Blogs. The RSL Music Blog has been booking shows for the last few years (we have four 2009 gigs by the end of this month - more on this soon). Last night we headed over to Great Scott to see the Boston Band Crush showcase featuring Midriff Record's Hands and Knees (great show guys!!) and fellow Boston blog Enough Cowbell recently hosted a DJ Benefit Night. These are the Salad Days for Boston Rock 'n' Roll and Music Bloggery! NOW SHOWING - For those of you reading in the greater Boston Metroplex - head over to the show tonight to be totally entertained. For those of you who just can't be there or are otherwise geography-challenged (other side of the country or the world for that matter), we encourage you to visit Bradley's Almanac and find out what all the fuss is about. Between Bang Camaro / Electric Six at the Middle East Down and this Bradley's Almanac showcase, I'm not leaving that block tonight.